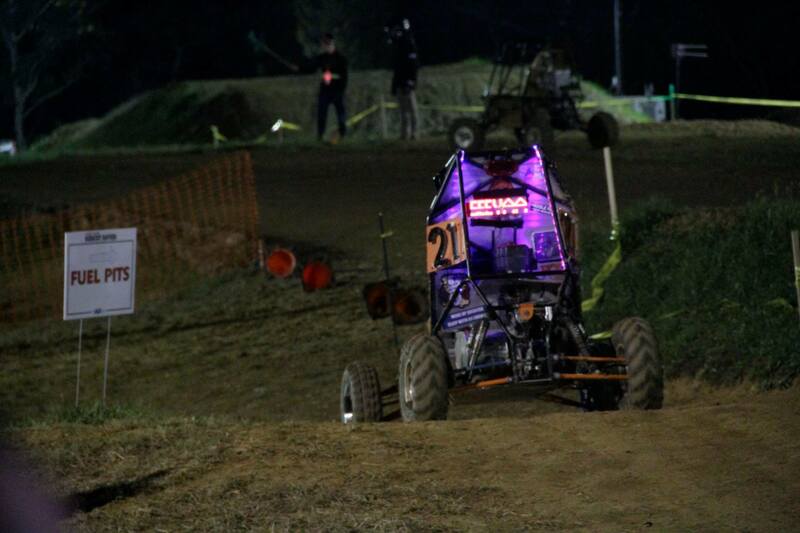 The Baja team is just getting back from our trip to Midnight Mayhem, and as always, we had a blast! This year we took a group of 25 people, including 15 new members of the Baja team. What’s even more impressive is that this year both the Rochester and California cars survived the entire endurance race needing nothing more than a few zip ties and a piece of Phil Swift’s quality Flex Tape. 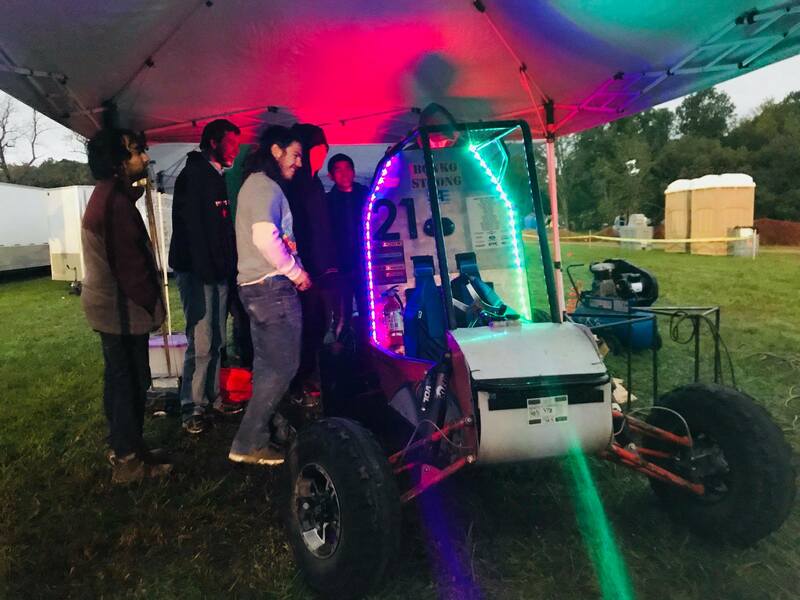 My favorite part of the event was seeing the new member’s reactions after they had a chance to drive in the endurance race. 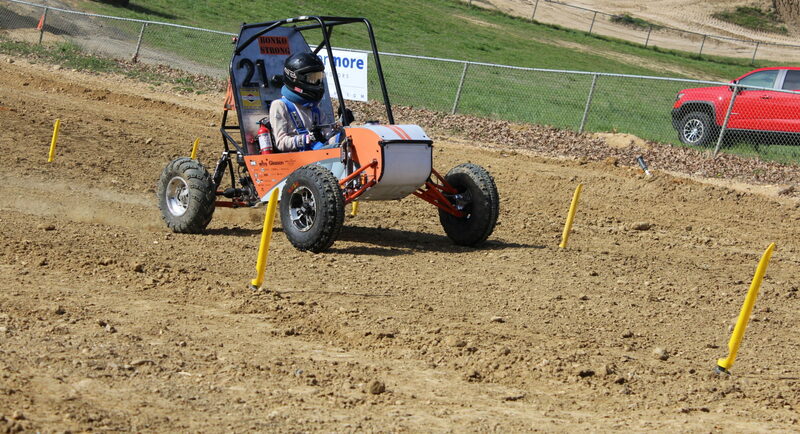 Even some of the more quiet members were exploding with excitement and adrenaline after they got out of the Baja car. We got to see everything from people literally jumping up and down to people telling stories about how they passed some of the other cars on the track. Everyone loved driving, and I’m happy to report that there wasn’t a single accident during the endurance race! This Midnight Mayhem was also quite interesting because of the events that they decided to run. Instead of the Baja Cross event that they had last year, we had “Barrel Climb”, “Barrel Jumping”, or “Barrel Racing”, depending on who was announcing. Essentially it was like the barrel racing event with horses, except with just one barrel and you started by driving downhill. In addition to Barrel Racing, we had a nice maneuverability course, and a good endurance course that went through the motocross track and the forest. Of course though, it wouldn’t be Midnight Mayhem without a little bit of…well…mayhem. In the morning of the event day, we tried to start our generator that we filled with a couple gallons of gas only to learn that it wouldn’t start. Despite the giant text on the front of the generator saying the minimum fuel required, we somehow managed to put less than the minimum required fuel in the generator. Also, quite conveniently, Rochester managed to break literal seconds after finishing the final lap of the endurance race. 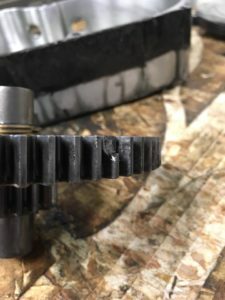 For those that haven’t seen the pictures yet, take a look and you’ll see that one of the bearings in the gearbox failed. At the time, we had no idea what happened, but people walking Rochester back to the paddocks reported hearing a loud, horrific sound followed by Rochester stopping dead in its tracks. But hey, Rochester broke after the race, so that still means we had a “flawless” event, right?